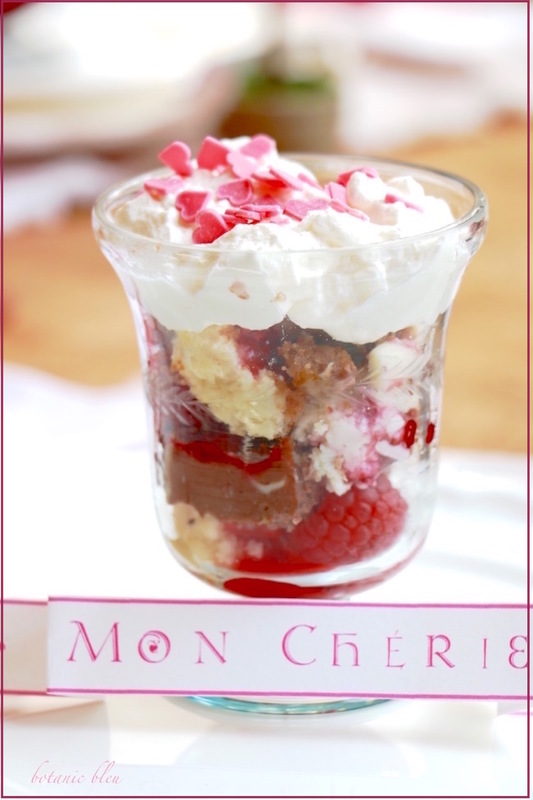 Mon Chérie (my dear/sweetie), how do you make raspberry cheesecake with limited time? Cheating, I know, but when time is limited, start with slices of cheesecake from the grocery's deli department. As long as the cheesecake tastes good, I'm all for easy and fast. 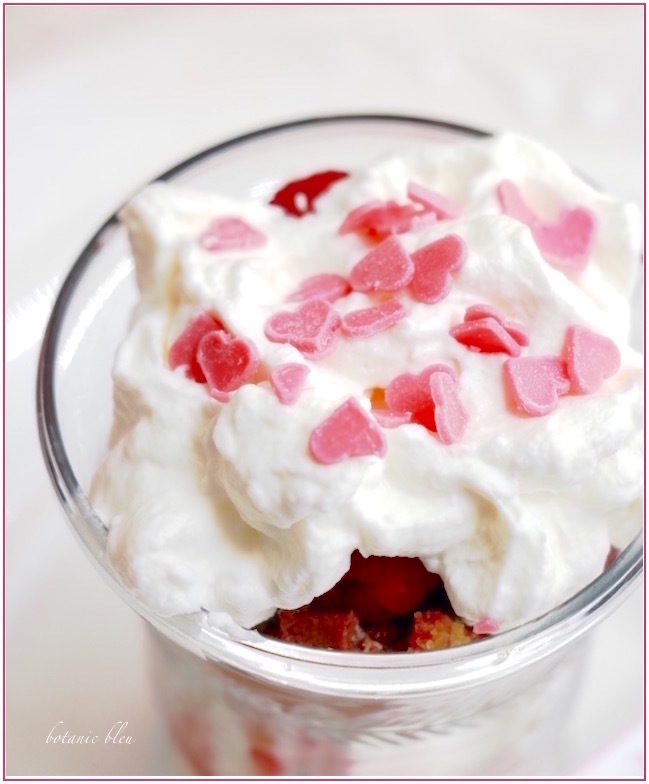 Make a memorable, delicious valentine dessert by adding to the basic cheesecake slices and serving the dessert in beautiful glasses. Warning: Now, I am a Southern cook which means a little of this, a little of that, a pinch of something else. The following recipe has not been tested in the Southern Living Test Kitchen under exacting conditions, and you may want to adjust the amount of sugar or water for a sweeter sauce and/or a thicker sauce. 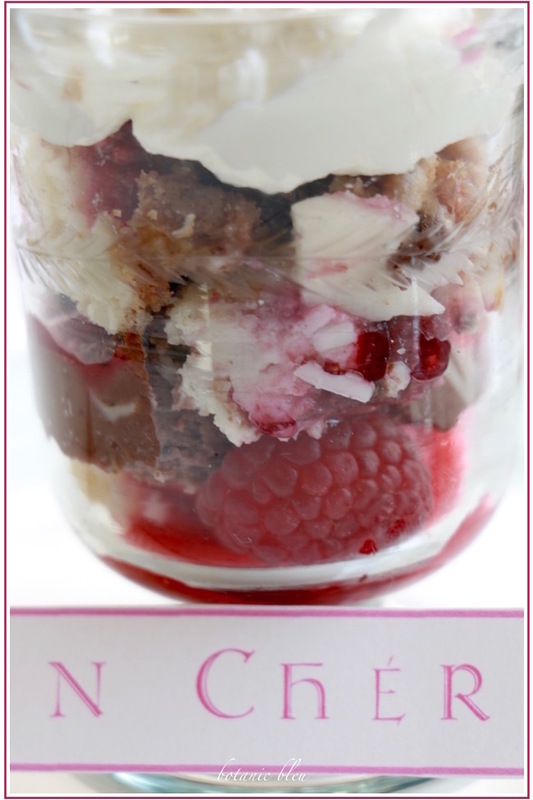 Set aside 3 raspberries per dessert glass. Add remaining berries, 2 Tablespoons sugar, and water to a heavy pan over medium high heat on the stovetop. Cook berries until berries break down, sugar dissolves and sauce thickens, at least 7-8 minutes. Strain cooked berries through a fine sieve to remove seeds. Set raspberry sauce in the refrigerator to cool while you assemble the rest of the dessert. Use a mixer to whip whipping cream in a large glass mixing bowl until soft peaks form; add 2 Tablespoons sugar and whip until dissolved; Set aside in the refrigerator until needed. Cut store-bought cheesecake slices into small chunks. 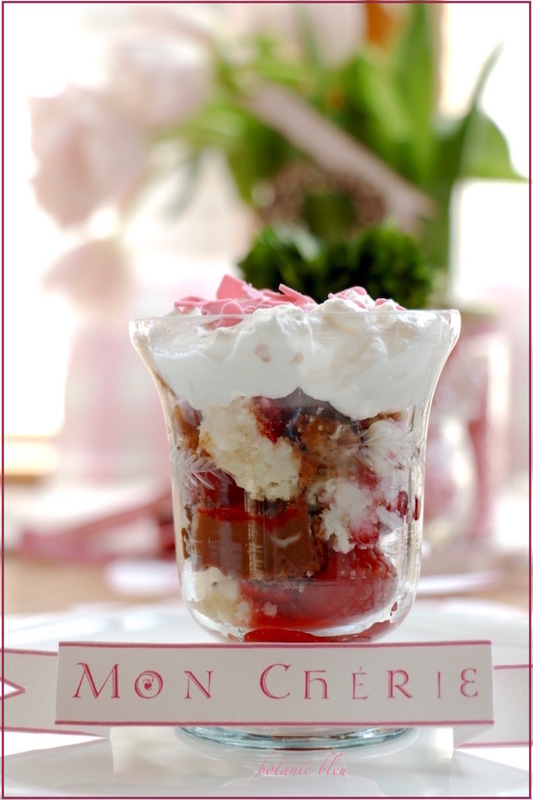 Place a large chunk with attached crust in the bottom of each dessert glass. Add a small amount of raspberry sauce on top of the cheesecake. 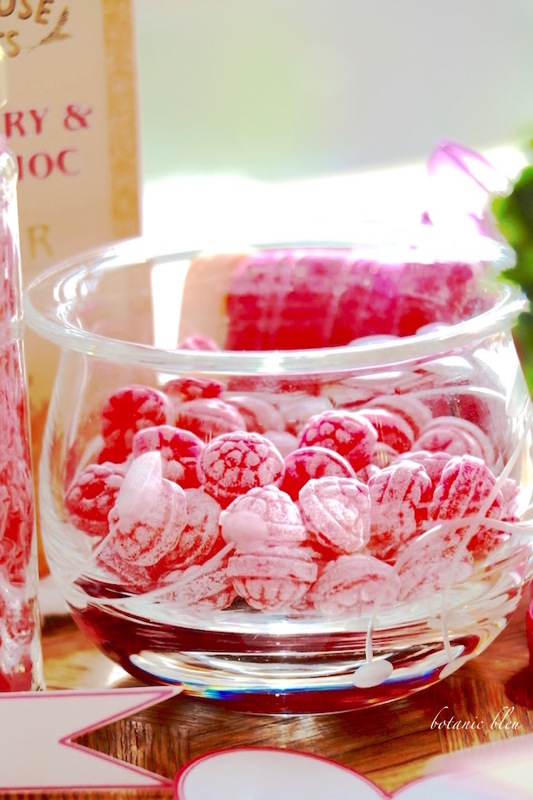 Add a raspberry to one side of the glass. Alternately add more chunks of the cheesecake, whipping cream, raspberry sauce, and fresh raspberries until the glass is almost full. Just before serving, add a large dollop of whipping cream to the top. Then add heart sprinkles and serve. Of course, you could serve the cheesecake slices on dessert plates, add whipping cream, fresh raspberries, and the heart sprinkles. But, doesn't the dessert-filled footed glass look more special? Valentine special? 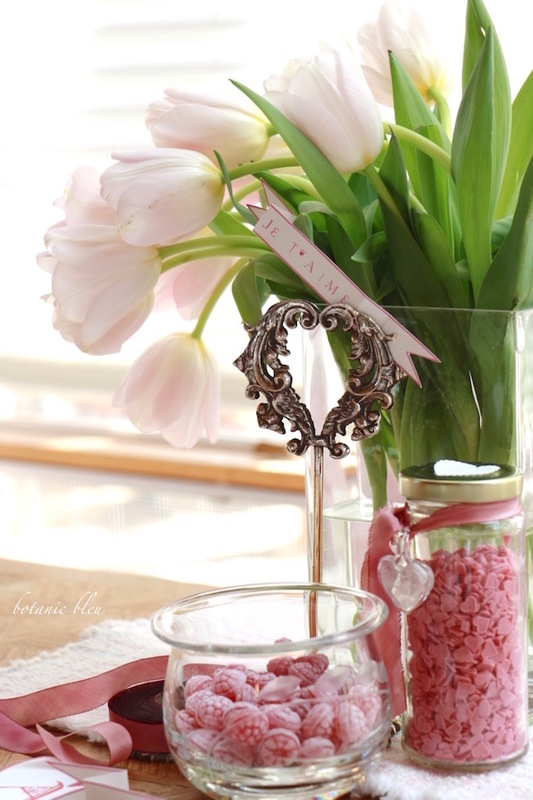 Create a centerpiece for the table with pink tulips, a French script banner, a spool of rosy red silk ribbon, and dishes of red raspberry hard candies and left-over heart sprinkles. 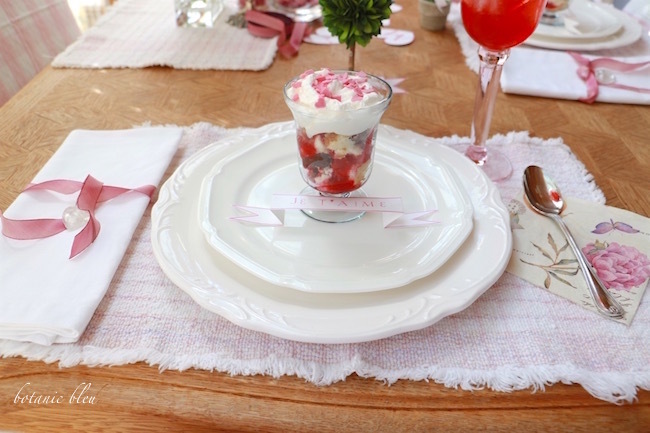 Who doesn't love a pretty table with fresh flowers, hearts, ribbons, French love phrases, and a yummy dessert for Valentine's Day? 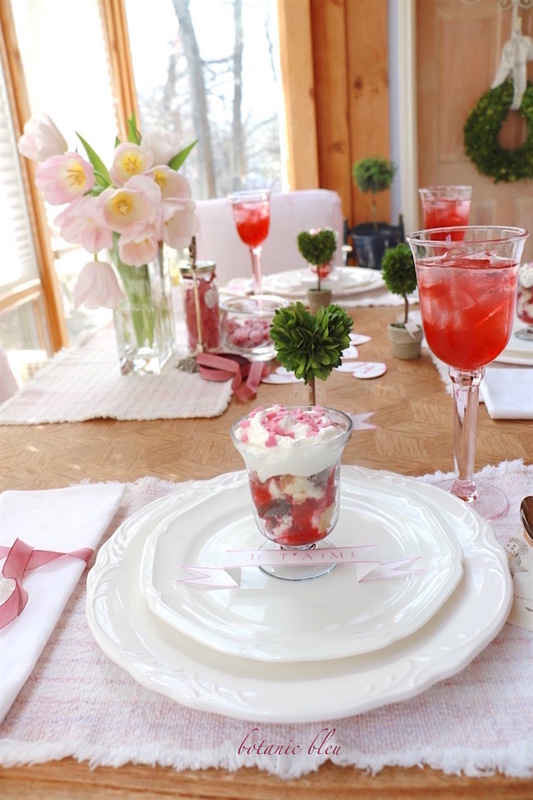 Ideas for a Valentine's Day table are easy to duplicate. 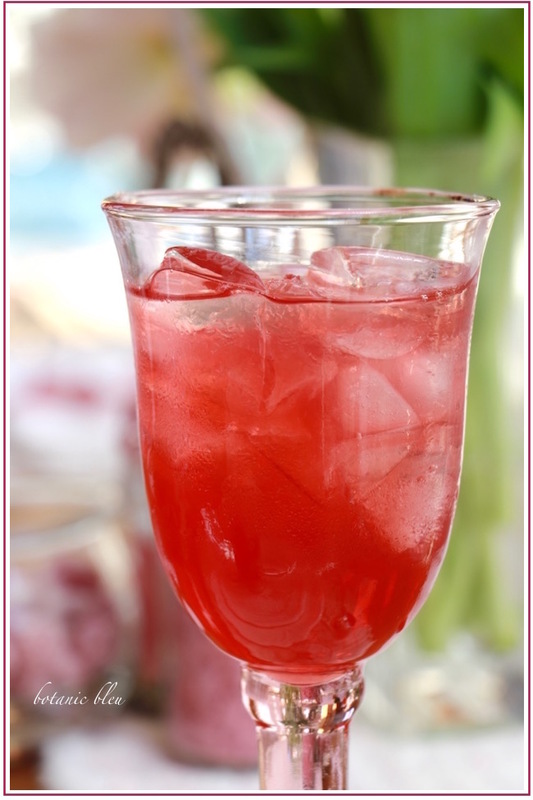 Cran-Raspberry juice is a refreshing non-alcoholic drink. The raspberries sweeten the tart cranberries. Red candies are easy to find at the grocery store. Fill a small clear glass bowl for the table. 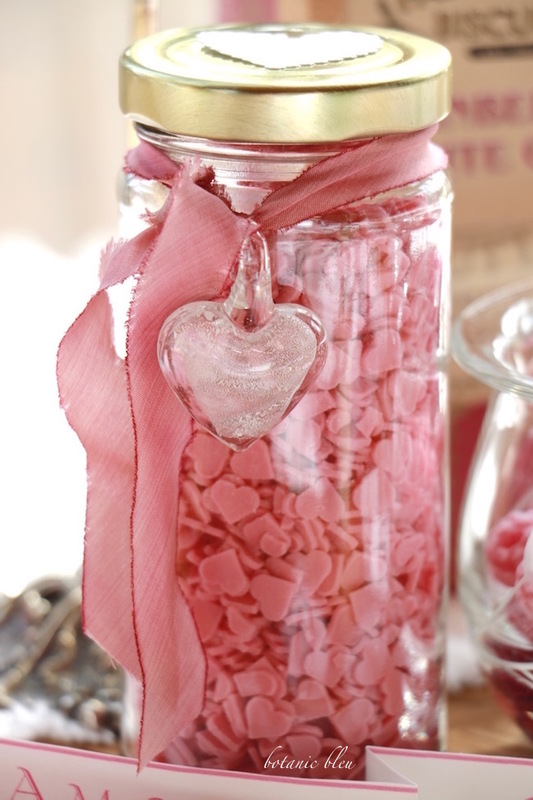 An empty relish jar becomes a valentine with the addition of a white heart sticker on the lid and a rosy silk ribbon holding a glass heart tied around the top of the jar. Small heart sprinkles coordinate with the silk ribbon color. Place a length of the same rosy silk ribbon around a cloth napkin, but do not tie completely. Swirl the ribbon edges around another white glass heart. 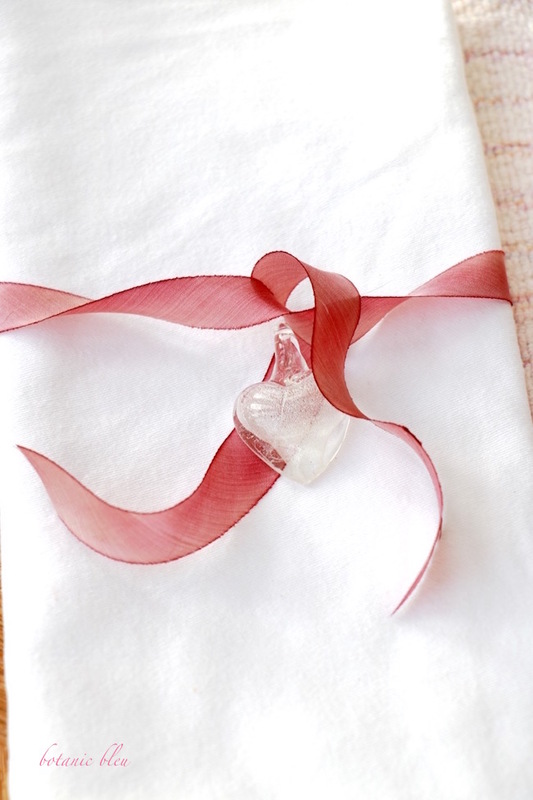 The ribbon and heart can be keepsakes that turn into a valentine necklace. 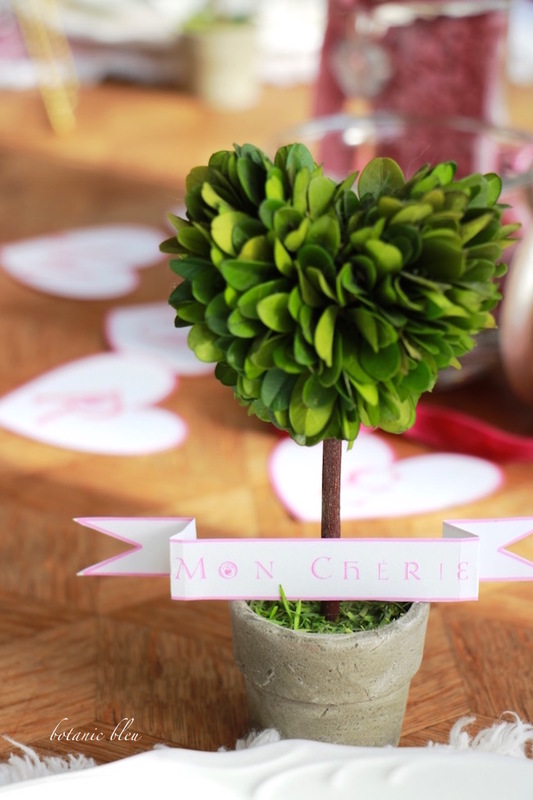 Add small valentine banners to heart-shaped boxwood place card holders. A link to a download for free printable French phrases is at the end of the post. 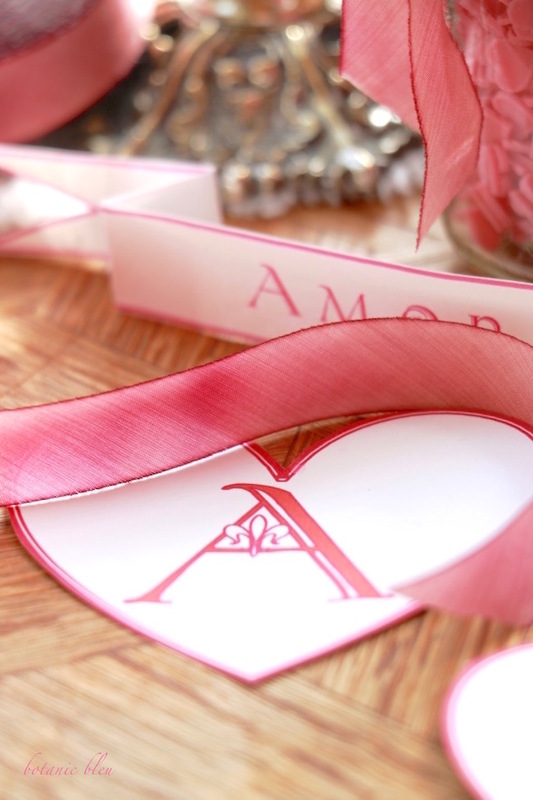 Scatter heart-shaped letters on the center of the table to spell AMOUR. See French Love Banner and Bouquet for a link to the download for free printable AMOUR letters in bleus and in reds. 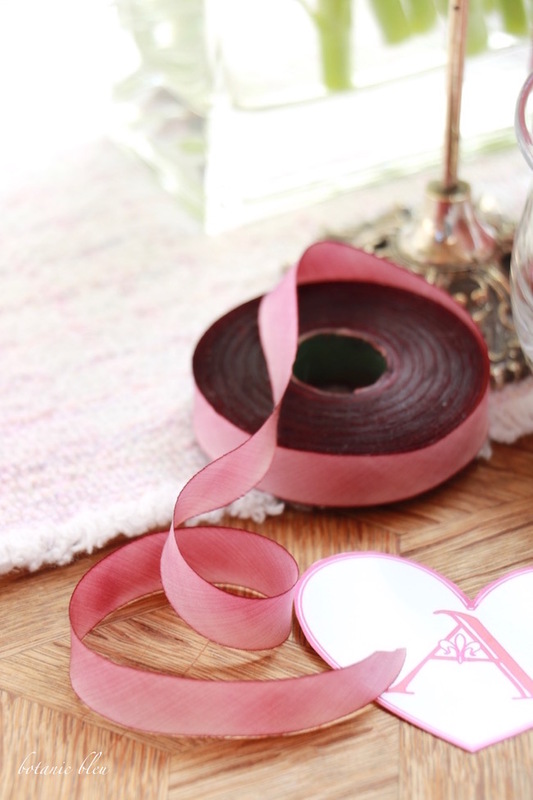 Everyday objects like unfurled spools of ribbon in valentine colors add romantic touches to table settings or arrangements on side tables. 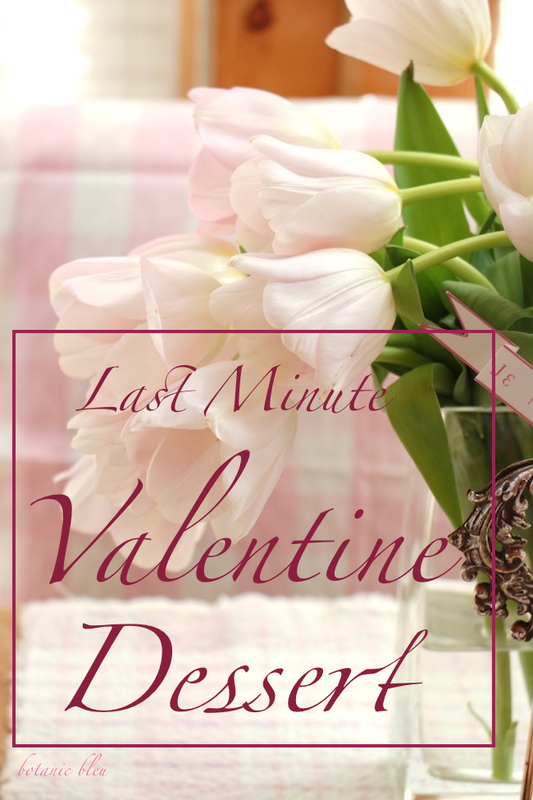 Want to remember how to create a last minute valentine dessert and the ideas for how to create a Valentine's Day table? Pin to Pinterest any of the photos or this special photo below that has the post title. Suggestions for ways to share Valentine's love. I would love for you to share a link to this post on your Facebook page. 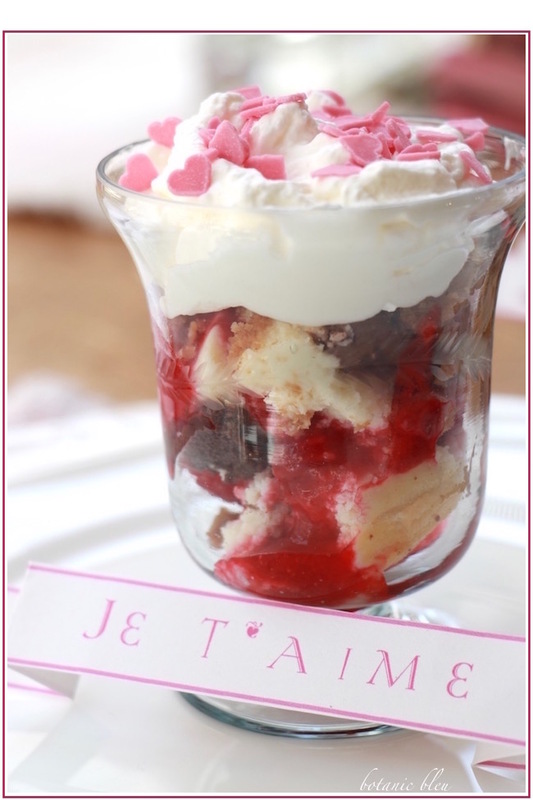 Download free Valentine French Phrases on Small Banners for place cards or table decorations. Choose blue, red, or rosy pink. Share your Pinterest, Instagram, Facebook, and blog photos to Monday Social that begins each Sunday at 4:00 p.m.
Not only is the dessert pretty, it looks positively delish! Your photos are stunning. Have a great week. Yum. Hope you're enjoying the day, Judith. Pure delight and decadence, that dessert - yum! Great little ideas for the occasion too. We love our sweets in this household. :)♥ Thank you for sharing. Every detail and Valentine idea is pure beauty and perfection! Your raspberry cheesecake dessert may be last minute, but it looks like a lot of love and creativity went into making it, despite it being quick. Your photos are lovely. These are great ideas and easy to do which is very nice with our busy lives. Thanks for the inspiration. I love fast, easy and pretty! Have a Happy Valentine's Day! Judith, that dessert looks and sounds amazing! Will definitely have to give this one a try. And your table looks gorgeous! Love those touches of red and pink! Hope you have a wonderful Valentine's Day! Love and hugs to you! Love it, Judith! It looks delicious and how nice it's easy to make. Your table is adorable! That looks so elegant and sounds delicious! mon cheri is right! I saw this dessert in your urn post and wished I had the recipe, so thank you!!!! It looks so elegant and tasteful. I want to make it for my husband this weekend.